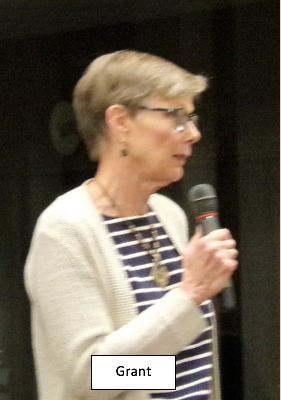 Just as she did during the candidate forum the previous week, Terese Grant, Co-President of the League of Women Voters in Grinnell, presided over a Tuesday-night gathering at the United Presbyterian Church. This week, however, on November 1, only one candidate was involved, and that candidate was not present. The candidate is the Veterans Memorial Building in the northwest corner of Central Park, and the levy proposal that Grinnellians will approve or reject on November 7 will likely determine the building’s fate. 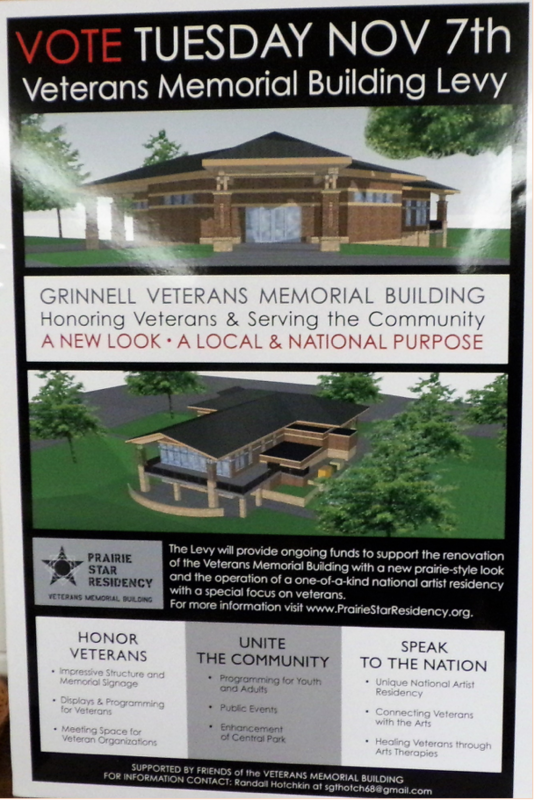 Shall the City of Grinnell, Iowa levy a sum of forty-one cents per thousand of assessed value for the purpose of the restoration, operation and maintenance of the Grinnell Veterans Memorial building for a period of twenty (20) years from First Levy. The League distributed question-and-answer sheets consisting of inquiries from League members to the city. City Manager Russ Behrens supplied answers. The purpose of the forum was to give interested parties an opportunity to ask questions and to express opinions. Speakers were asked to use a microphone, to state their names, and to present from the front of the room. Each speaker was limited to two minutes, but no limit was set for the number of times a speaker could take the microphone. First to speak was attorney Tom Lacina who, this past January, offered a proposal to maintain the Veterans Memorial Building as an artist residency with veteran emphasis. Following this proposal and its subsequent approval from the Veterans Memorial Commission, Lacina conducted question-and-answer sessions and presented his plan to service groups and various organizations throughout the community. Randy Hotchkin was the next speaker. 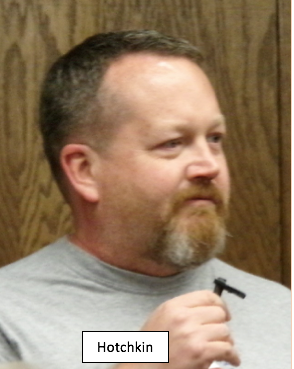 He has addressed the building issue several times on KGRN and has written to the Grinnell Herald-Register. He referred to this father, a veteran of the Vietnam War, who suffered from PTSD but who was helped by hands-on activities such as picture framing. A formal art therapy program could benefit veterans today, Hotchkin urged, noting that United States veterans are dying at the rate of 20 per day from suicide. In the general question session that followed, Tom Lacina was able to provide most of the answers. Will the levy, if approved, include building renovation? No. The levy should generate about $112,000 per year for 20 years. 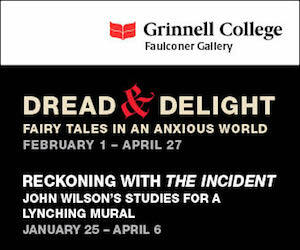 That will not be enough to renovate the building and establish an artist residency program. Assuming that the funds generated by the levy will go toward the maintaining the building each year, is there a budget proposal that recognizes that $112,000 may not be enough? There is a financial pro forma on the website at www.prairiestarresidency.org. Would you speak about fundraising efforts? A fundraising committee is established, but it is not active at the moment. Lacina stated that he is awaiting the outcome of the levy vote. The committee, when active, will seek funds both inside and outside of Grinnell on a statewide basis. Members include retired congressman Leonard Boswell and retired senator Tom Harkin. Another commentator expressed concern about the specific market that the artist residency program would target. Is there a demand for the program? The speaker suggested that the concept be developed further and backed by more specific data. Is there a provision for a pilot program as opposed to the full-blown proposal? 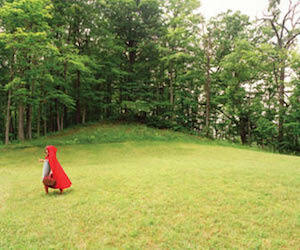 Not exactly, but the artist residency program could develop in any number of ways once established. Lacina referred to his experience with Grin City Collective as a basis for some expectations. Comments followed on the issue of assessed valuation versus taxable valuation, an item that has generated some confusion. The levy calls for “a sum of forty-one cents per thousand of assessed value,” but that amount could be lessened if the forty-one cents is applied to taxable valuation. The situation is not clear. 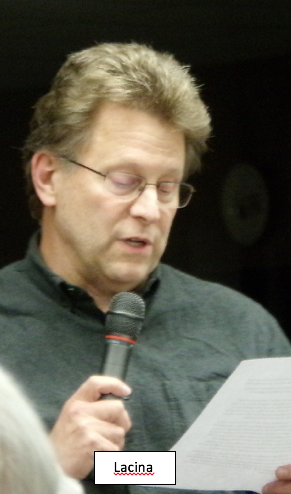 Randy Hotchkin recapped his attempts to receive clarification from the City of Grinnell; the last answer provided was to continue to use the language that will appear on the ballot—forty-one cents. “Are there issues?” Lacina asked rhetorically. “Yes. Any bold plan is going to carry risks.” He closed by reiterating the hope that the community can pull together and move forward. Terese Grant urged all in attendance to vote at the Elks Club on Tuesday, November 7.